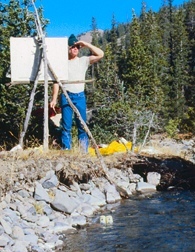 In 1997 we returned to Colorado to complete field work for a special commission (see ARTIST: COMMISSIONS - 1994 HOPS). 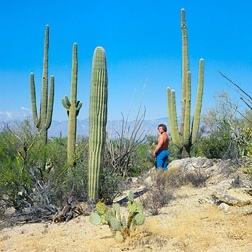 Seeking the unseen rhythm and hidden life in the lush desert with the Sonoran Mountains as a backdrop. & "Mountains High - Grand Tetons"
As early as 1978, Hal was exploring the deserts, mountains, forests and shorelines of America -- on the road, by foot, and on horseback, creating "WILD," a suite of six hand pulled original lithographs expressing the major wilderness habitats of the United States. Resulting works include "Boulder Creek," "Sonoran Saguaro," and "Grand Tetons at Jackson Hole." 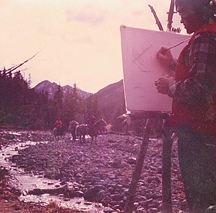 Also from the Wyoming adventure on horseback, Hal created two watercolors entitled "Peter's Tree," and "The George Bowl" (inspired by an unexpected high altitude blizzard with zero visability. as his friends ride back to camp.